The arrowhead spider is easy to identify: A triangle of color on the abdomen resembles a white, pink, or yellow flattened drop of shiny glue pointing away from the spider's head. Late summer and fall woodland hikers can count on walking into the arrowead spider's web. Its wheel-shaped web is small and delicate and generally positioned vertically. This orbweaver probably is less common than the spined micrathena, but it is just as strikingly colored and shaped. On females, the carapace (head) and legs can be black, brown, or rusty red; the carapace is small compared to the triangular abdomen. A triangle of color almost completely covers the top of the abdomen, with the bottom angle pointing away from the spider's head; this triangle resembles a white, pink, or yellow flattened drop of shiny glue. This species is Missouri's only orbweaver that rests centered in its web head-up instead of head-down, and the legs are often folded up against the body. Males are smaller and don't look very much like the females, as they lack the characteristic triangle on the abdomen. Males are rarely seen unless they are in a female's web either courting or mating with her. Similar species: Missouri's three species of Micrathena spiders are also small orbweavers that live in similar habitats. They are all easily distinguished by comparing photos. Lengh (not including legs): 3/8 inch (females); males are slightly smaller. 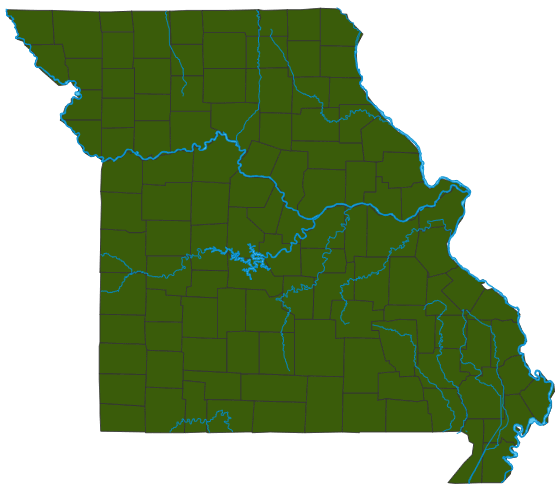 The arrowhead spider is very common in Missouri. There are many color variations. The arrowhead spider usually rests centered in its web head-up instead of head-down. Here, it is shown sideways. The habits of the arrowhead spider (triangle orbweaver) are similar to those of the spined micrathena, Micrathena gracilis. Most commonly seen in the woods in late summer and early fall. The females take advantage of the open areas of hiking trails, which flying insects — their prey — use as trails, too. Also often seen in yards and other places where trees and bushes create appropriate open areas for them to spin their circular webs. Orbweavers typically capture insects in the sticky strands of their webs, then deliver a bite of venom sufficient to subdue and to begin digesting the insides of the insect. Then they wait, returning to the prey to ingest its liquified contents. The close spacing of the circles in the webs of this species enables them to specialize in tiny flying insects such as mosquitoes. They are ferocious predators to small insects, but they are completely harmless to humans. The genus name, Verrucosa, means "warty" and refers to the small wartlike bumps on the abdomen. This is the only species of Verrucosa in the United States. As a general rule, spiders in our area hatch from eggs in spring and spend the growing season eating, maturing, mating, and laying eggs. Females are capable of creating webs; males are not. Females continue creating egg cases as long as the weather holds out. As temperatures cool in fall, their metabolism slows, and they generally die when it freezes. Egg cases overwinter, and spiderlings hatch in spring. Although it's icky to walk right into a spider web, remember that it's also unpleasant to be plagued by insects such as flies, mosquitoes, and gnats. Spiders act as natural, organic “exterminators.” Don't let them keep you out of the woods; simply twirl a twig before you as you hike. Spiders are little predators that help to control populations of the insects they capture. Being small themselves, they easily fall prey to larger predators such as birds, reptiles, and mammals. Many animals eat their eggs. Hummingbirds, vireos, and warblers steal webs from spiders in order to build their own nests.